Fat: Fat content is by far and away the greatest contributing factor to consuming an energy dense diet. Absolute intake more than doubled (2.5X) from Q1 to Q5, and comprised roughly 90% of the increased caloric intake. Animal Protein: As protein intake from plant sources remained relatively constant, animal protein intake increased by 40% resulting in an increase in total protein of 25%. Therefore animal foods are a considerable contributor to increased energy density of the diet. Added Sugars: Added sugar comprised 11% of caloric intake across the quintiles, however absolute added sugar increased almost 50%. Carbohydrate: Total carbohydrate intake is not associated with increased energy density of the diet. Increases in added sugars were offset by reduction in other carbohydrates so that absolute intake remained constant. Thus as a percentage of the caloric intake, carbohydrate declined significantly. 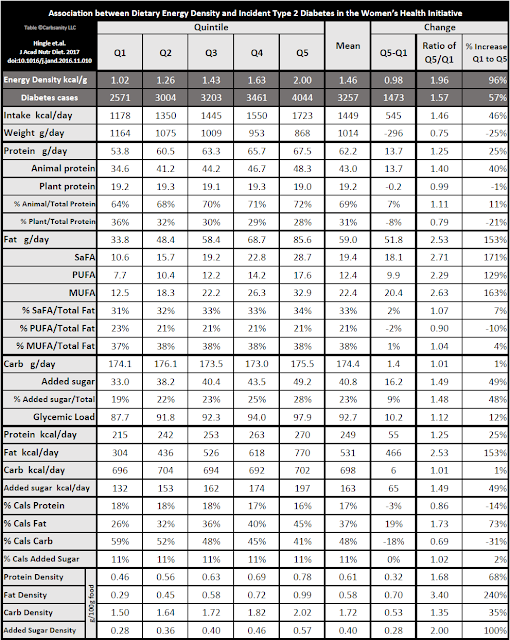 The macro percent composition of the least energy dense diets was P/F/C of 18/26/59, while the percents were 16/45/41 for the most energy dense diets. The near doubling of energy density is associated with an (adjusted) roughly 25% increase in the risk of developing diabetes. The Women's Health Initiative (hereinafter WHI) was a prospective study in over 140,000 post-menopausal women that began in 1992. The study included both a hormone replacement therapy and a dietary modification arm. There have been numerous publications and studies stemming from this study. This latest study included all of the women, and stratified the baseline dietary data into quintiles based on the energy density (kcals per gram of food). For those unfamiliar with quintiles, the sample was broken down into five equally sized groups, where the first quintile represents the lowest energy density through the fifth quintile representing the highest energy density. They then looked at the number of women who developed diabetes in the course of the study. Those of us looking to increase our healthy functional lifespan through our dietary approach are often just overwhelmed and confused by the diet wars and the sheer volume of the evidence (confirming, contradicting, or seemingly so for either) presented by all sides and various authorities. But it seems as if pretty much everyone agrees that in an ideal world, the vast majority of one's diet should be comprised of "real, whole or minimally processed/refined foods". But aside from that, what qualities of the diet are best to implement and/or avoid to minimize risk of metabolic diseases? When one distills down all of various nutrition and metabolic studies, it seems abundantly clear that the unifying cause of metabolic disease is energy excess. Regardless of the hows and whys of getting to the point of excess, that IS what it is. So what dietary pattern most leads to energy excess? This study sought to look at the energy density of food as a possible culprit. By stratifying to quintiles for this factor, some interesting trends emerge as to the relative contribution of the various macros to the total energy density of the diet. In the end, the study concluded that when comparing the highest with the lowest quintile for energy density, there was an (adjusted) 24% increased risk of developing diabetes. Regardless of how seriously one takes the hazard ratio (HR) of 1.24 to be, it is informative, in my opinion, to look at the other dietary components that go along with this. Here is the table from the study, condensed to show just the totals for the three major macros. The amount of food (by mass) decreases by roughly one-fourth. So, I ask: Is excessive carbohydrate intake the "obvious" culprit in the development of diabetes? I have been beating the same dead horse regarding what the low carb community portrays as "carbs" for a long time. Even highly refined carbs such as white flour and sugar are rarely the sole or even major source of calories in processed foods ... sodas/SSBs being a notable exception. So for starters, carbohydrates per se do not seem to be a contributor to increased energy density and corresponding increased energy intake in this study. These women were not eating "Low Fat" in 1992! Before moving on, I didn't want this observation to get lost in the shuffle. Low carb advocates are repeatedly beating a drum that the "low fat" dietary guidelines caused the obesity epidemic. Furthermore, they claim the "high carb" diet is responsible for rising rates of diabetes. Nina Teicholz claimed in The Big Fat Surprise, that the low fat diet harmed women the most! The "low fat upturn" started in 1980, despite the official 30% recommendation not kicking in until 1990. Still, baseline data was collected a couple of years after this during the low fat boom. The average fat intake was 37% -- not unlike 1970s NHANES data! Only the lowest quintile were below the 30% ceiling for low fat. The top 40% of women averaged 42.5% fat in their diets!! Tell me again how Americans "dutifully obeyed" the dietary guidelines? But more to the point, a low fat eating pattern is associated with both lower energy density AND lower caloric intake. Tell me again how the carbohydrate stimulate insulin results in "internal starvation", hunger and overeating? Please!! The table below looks at various Q5 vs. Q1 comparisons. The absolute fat intake increases substantially -- 2.5 times higher! Any which way you slice this data, fat is the single greatest predictor of an energy dense diet and increased caloric intake. The absolute added sugar intake increased in direct relationship to total intake. The increase in added sugars tracks directly to increased total intake, and the percentage of calories from added sugars remains constant at 11%. The absolute protein intake increased at a rate of about half that of total intake. Plant protein intake remained relatively constant, thus almost all of the increased protein intake is animal protein. A 46% increase in caloric intake corresponded to a 40% increase in animal protein. Although percentage of protein increases slightly, its relatively constant ~17% of total calories. The total carbohydrate intake remains constant through the quintiles of increasing energy density. Limit meats and other sources of animal protein, particularly "fatty meat" and cheeses. Personal Note: As a postmenopausal woman myself, these align with changes I made in my own diet two years ago now. I never found this kind of confirmation for my previous dietary lifestyle -- short term weight loss trials simply don't provide these sorts of clues. When I keep my fat intake low, I have no problem maintaining weight or feeling like I am not able to eat a "normal amount" of food. I'm eating more carbs on a regular basis than I did for years and years on low carb, and my last HbA1c was under 5. One of the individuals in that discussion where this originated is obsessed with what he calls CARB Factor -- grams carbohydrates per 100g food. (I'm not entirely sure this self-styled definition has not changed, but let's work with it.) He is equally obsessed with the concept of "acellular carbs", another concept put forth by a single person (Comparison with ancestral diets suggests dense acellular carbohydrates promote an inflammatory microbiota, and may be the primary dietary cause of leptin resistance and obesity Ian Spreadbury). To me, if carbohydrates were a major contributor to developing diabetes, it would have to be through increased intake. The #LCHF-raud way to address this seems to be to then focus on the quality of the carbs -- e.g. sugar -- and then circle back around to "all carbs turn to sugar in your body" ... but I digress. In any case, the discussion turned to how this CARB Factor did indeed increase through the quintiles, thus lending credence to his idea. This led me to a desire to look for trends in a number of parameters, ultimately culminating in the table above. As it turns out, all macro density "factors" (bottom rows) increase through the quintiles because the total weight of food consumed is reduced by one-fourth. Carbs do not seem to be where we should be looking. Even added sugars are anemic when compared in absolute amounts and impact ... especially when compared to fat!